VMware has pondered baking backup and disaster recovery into its VSAN software-defined storage tool. In conversation with The Register Hogan later described the backup feature as snapshots. Backup would also offer AWS as a target, the idea being that VSAN on-prem and in the cloud makes for a backup arrangement that should offer fast restores . Adding such features will, Hogan added, help VMware to change perceptions of VSAN as best-suited to non-critical workloads. “We were extremely cautious when we launched VSAN,” and therefore recommended it for simple workloads or test and development environments. Users therefore didn’t think VSAN was ready for prime time. Hogan said the product has reached "feature parity” with rival hyper-converged and added “the mindset is changing” among customers. Adding backup and DR will change things further, but Hogan said VMware will also continue to support data management software vendors and the APIs they rely on. 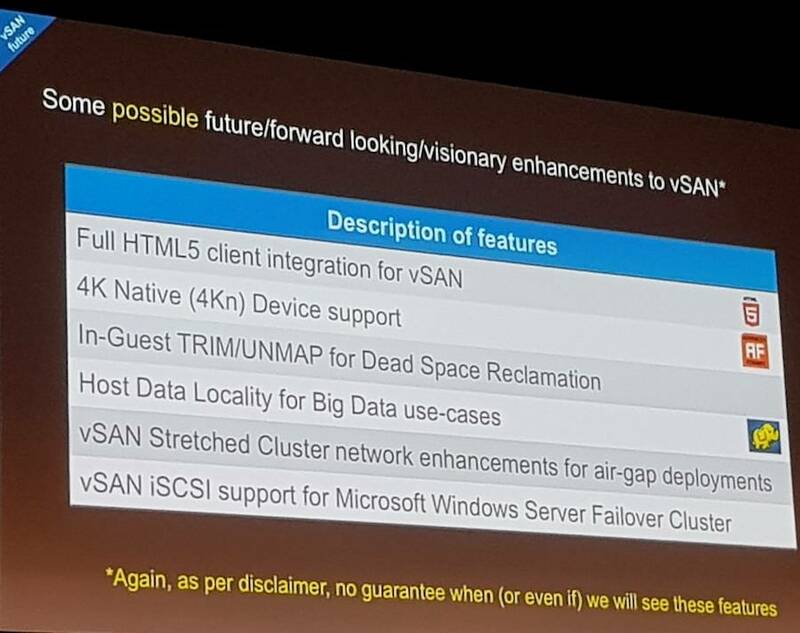 Hogan also popped up the following slide with more hints of VSAN's possible future.